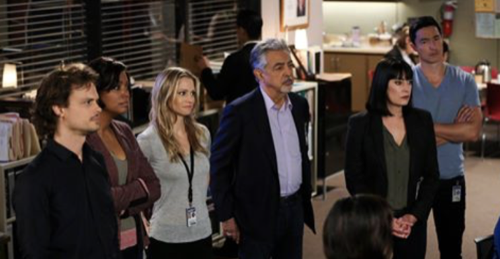 Reid returned on tonight’s all-new episode of “Criminal Minds” because he received a mysterious email that told him to go to storage locker if he ever wanted to find a former member of the FBI. Reid hadn’t been sure if the email was a hoax or not. He thought it looked it real because the email had come with the picture of Former FBI Agent Owen Quinn’s badge and so he decided he go carefully. He told Prentiss that he needed to come off his sabbatical for special circumstances and had used his newly returned federal resources to go that storage locker with reinforcement. Reid had believed that he was going to find Quinn dead and instead he found Quinn pretending to be dead. The former agent said he had gotten kidnapped a year ago and that the only way to stop his captors from hurting him was slowly slowing down his breathing. He had wanted them to believe he has died in their care. Quinn later told Reid that he was going to try to make a run for it the moment he was away from them, but they hadn’t dumped his body like he thought they would because instead, they left him in that storage locker. Quinn said he again pretended to be dead again when he heard people were coming in and so he had been glad to find out it was the FBI. They just hadn’t been sure about whether or not they were glad to see him. The team had once interviewed Quinn for a position as a profiler and they hadn’t thought he was any good. Quinn had gone to them saying he was onto a serial killer that he dubbed “The Strangler” and right away that had told them he wasn’t going to make the team. They frowned on nicknaming these Unsubs because that also forces people to have a certain mindset about them. The team also found several other worrying signs like how Quinn could only connect this new Unsub with one victim. The victim had been strangled and then cut open with someone removing the bone that this Unsub had crushed. It was a horrifying way to die and the team truly believe that except it was still just the one victim. They were going to need more to buy Quinn’s theory and so that’s when he pulled several missing person files. He said that they could all be victims and then later some of those “victims” were found alive. There had been two cases that were still inconclusive because the bodies were never found and so that wasn’t a pattern. The team had dismissed Quinn’s theory and then later he quit the bureau. He told Reid it was so that he could focus on finding “the Strangler” and it seems his wife thought he went too far with his investigation. She said she remember how it consumed Quinn to the point where he wondered to her what it be like to strangle someone like the Unsub allegedly did and that had been enough to make her frightened of him. His wife hadn’t been happy that he was back while his son differ because he said he had a good dad. His dad was always there for him and would never have abandoned them like his mother thought he did, so that gave the team different theories. They questioned if he had really been captured. There were some on the team that thought Quinn had made up the whole story because he wanted to be the hero. They also came to believe this theory because often Quinn would give them information and then not enough. He told them how the couple that turned out to be married Unsubs had taken him back to their home and had left them in the living room even as they went about their lives. They would greet their son and tell him to be good at school while Quinn was tied to a chair right in front of them, so that just hadn’t made sense to the team. They wouldn’t believe a family could normalize abducting a former federal agent and therefore they searched that storage locker for everything and anything because they suspected Quinn might be this “Strangler”. They said Quinn could have suffered from a mental break and that he was killing people yet not remembering it like maybe he was blacking it out and so they checked into theory. They searched the storage lockers and found bones belonging to seven victims in there and what they couldn’t understand was if Quinn was the Unsub then who locked him in the storage locker. Reid was the one person that believed in Quinn’s story and so he got Quinn to tell him everything about his time in captivity. The other man hadn’t wanted to go through the torture and so he talked about the other things. He said he had been moved to the basement and that he had a bucket to use, he also said the one bright spot in the whole thing had been Theo. Theo would talk to Quinn about his classes and some of the topics covered rang a bell for Reid. Reid remembered a teaching a class on profiling that covered everything Theo had talked about with Quinn and so they had used to find this Theo. Reid had recalled his classes and the one face he remembered matched Theo Holt. That had been the kid taking the most notes and so that’s why he had reached out to Reid. Reid wanted to know what had been the catalyst and he pushed until Quinn mentioned the rest of the story. He told Reid that the parents had brought Theo and Theo’s girlfriend April down into the basement one day because they thought April was a bad influence. She was making Theo soft and they wanted to teach him a lesson. They told Quinn to kill April or they were going to kill Theo then Quinn. So Quinn said that’s when he moved to strangle April and that Theo chose that moment to strangle him. The next thing Quinn remembered was waking up the storage locker and what they learned later was that Theo turned against his parents. He killed them both in that same basement and had then disappeared with his girlfriend, so they thought Theo could be dangerous because of his parents and that theory had seemed to work. They later found two bodies that Theo had staked up however it turns out he had killed those two for the same reason he had killed his parents. The men he killed had their fingerprints burned off and that showed a group was looking Theo. Only Theo was hiding from his parents’ friends. He was hiding possibly with his girlfriend and so the team looked into her until they found out where the young couple went to hide. It was an old cabin that belonged to April’s grandfather and the team had found them there, except Theo asked them if they got everyone. He said his parents would only kidnap people for their Messiah to kill and that the group he was hiding from was a cult. The cult called themselves the Believers and they were more or less a group of serial killers, but the BAU used the information that Theo gave them to find this Messiah and they arrested him without a problem. It had been so easy that the team believed that was it until Prentiss had a worrisome question. Prentiss said if burning off their fingerprints were part of the cult’s initiation then why did they do that to Quinn. Quinn had been held captive for a year and so she thought the cult might have turned them, she and her team texted everyone that was still in the building that Quinn was dangerous. Garcia had gotten one of those messages because she caught on that her team believed Quinn was going to break the Messiah out of federal custody and so she warned a woman that worked with Quinn that he was dangerous. Except the woman she warned just so happened to be part of the cult and they had burned Quinn’s fingerprints as a false flag. It would draw attention to him which left the true threat to make her move unimpeded. Garcia therefore forced the cult to move things up a bit. They kidnapped her and shot Quinn because he was no longer of value though they were going to use Garcia to force Reid into helping them free their Messiah.